TwinSpires Blog: What’s Speed Got to Do with It? As the field turned for home in the 138th Kentucky Derby, many watching the big race undoubtedly felt as I did — that they were witnessing the birth of a superstar. Bodemeister, a three-year-old son of Empire Maker, had cut out wicked fractions — 45.39 seconds for the opening half mile (fifth-fastest in history), six furlongs in 1:09-4/5 (fourth-fastest) and a mile in 1:35.19 (fourth-fastest) — yet, with two furlongs to go, he was leading by three lengths and seemingly on cruise control. In mid-stretch, the colt trying to break the dreaded curse of Apollo (the last horse to win the Run for the Roses without starting at age two — in 1882), still had a three-length cushion. But, alas, he was starting to tire. With powerful strides, the California-based I’ll Have Another pulled up alongside Bodemeister with a sixteenth of a mile to go and gradually drew clear by 1 ½ lengths. Meanwhile, the Derby favorite was all-out to hold on to second from a late-charging Dullahan, who wound up finishing third, and Went the Day Well, who came in fourth. Not surprisingly, after the race, all the talk was about the runner-up. Barry Irwin, owner of last year’s Derby champ, Animal Kingdom, was equally impressed, noting that Bodemeister was the horse to beat in the second jewel of the Triple Crown (the Preakness Stakes, scheduled for May 19). “Whether he'll be able to fend off other horses on the lead and come back in a relatively short period of time, I don't know, but from a pure talent point of view, he looks like he's the one,” Irwin told Newsday. Even veteran turf writer Andrew Beyer was singing the praises of Baffert’s bridesmaid after the Run for the Roses. Despite his admiration of the colt’s tenacity, however, Beyer and his associates assigned Bodemeister a lowly 99 Beyer Speed Figure for his performance in Louisville. The Derby champ I’ll Have Another didn’t fare much better. As word of the light Derby Beyer spread across cyberspace, many race fans were incredulous: How can the number be so low, they wanted to know? Surely a final time of 2:01.83 is better than Super Saver’s 2:04.45 in 2010, track condition notwithstanding? Brows became even more furrowed when the other figure-makers started weighing in. Contrary to Beyer, Brisnet gave I’ll Have Another a very respectable 108 speed figure — the best since Mine That Bird in 2009 and equal to the figures awarded to Funny Cide in 2003 and Street Sense in ’07. 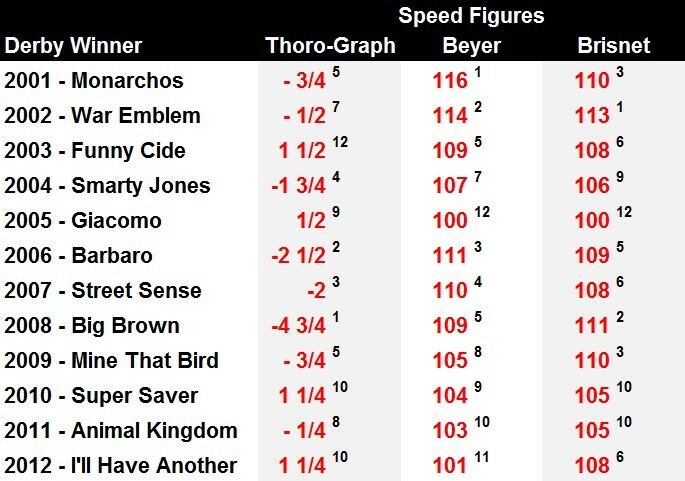 Thoro-Graph, which uses a descending speed figure scale — the faster the race, the lower the number — more or less agreed with Beyer. I’ll Have Another earned a 1 ¼ Thoro-Graph rating for his Derby score, which equaled Super Saver’s number in 2010, but was greater (slower) than the -¼ Animal Kingdom recorded last year. So, who’s right? How fast did I’ll Have Another and Bodemeister actually run this past weekend? To answer that question, I decided to compare this year’s Derby to Derby 127, which took place in 2001 and was won by Monarchos. 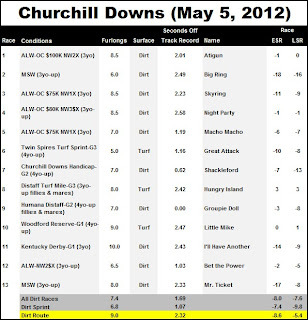 Well, as many people know, Derby Day 2012 produced some very quick times, including a track record for seven furlongs in the Humana Distaff. 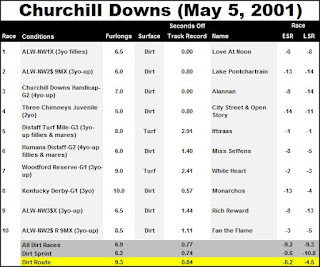 But what many people may not know is that the Churchill Downs main track was even faster on the first Saturday in May of 2001. In addition to a track record at seven furlongs (the one broken by Groupie Doll in the Humana Distaff), May 5, 2001 also produced a new track standard for 6 ½ furlongs — one that remains intact today. What’s more, Monarchos became only the second horse in Derby history (Secretariat was the first) to break the 2:00 mark when he finished the 1 ¼-mile journey in 1:59.97. 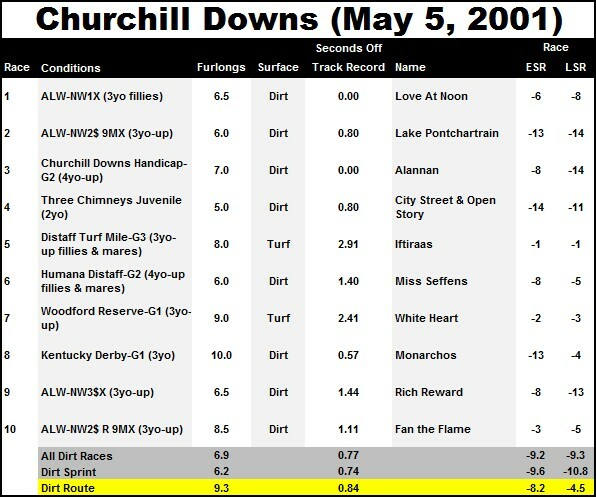 Among all the dirt routes contested that day (including the Derby), the average time was just 0.84 seconds off the track record in each race. Notice that the average dirt route time was 2.32 seconds off the track mark in each race — a full 1.48 seconds slower than ‘01. Of course, to determine what this actually means, we would need a method of assessing the overall quality of those races; obviously, one would not expect a $10,000 claiming affair to be run as quickly as a graded stakes race — all else being equal. That’s where the speed figure guys come in. By comparing winning race times to a par, or average time, for the class and distance, they are able to figure out how fast or slow a track was on a particular day. As you might guess, these determinations are generally distinct for sprints and routes, as well as for turf and main track contests. For the sake of argument, though, let’s assume that the undercard quality was about the same this year as it was in 2001, meaning the 1.48-second difference between the two years is as legit as MC Hammer once was. Using the chart below, we find that on the Beyer scale a length/fifth of a second is equal to about 1.5 points, whereas a length/fifth of a second is equal to about 1.1 points on the Brisnet scale (I ignored the Thoro-Graph figures in this example, because they also factor in lengths lost on the turns, wind speed and other things that the Brisnet and Beyer figures do not). This means that May 5, 2001 was about 11 Beyer speed figure points and eight Brisnet speed figure points faster than May 5, 2012. Hence, according to the Beyer numbers, Monarchos ran about 2 ¾ lengths faster than I’ll Have Another, whereas the Brisnet figures show I’ll Have Another approximately 5 ¼ lengths quicker than Monarchos. One will notice that my pace figures — which are relative, thereby negating track speed — show nearly identical dirt route averages… yet the Derby figures are vastly different. Thus, by comparing the early and late speed rations (each point counting as a length) of Derby 127 and Derby 138, it appears that Monarchos ran about 4-5 lengths faster than I’ll Have Another. Using the former animal as the standard, this suggests that I’ll Have Another should have earned a Beyer in the 108-110 range and a Brisnet speed figure in the 104-106 range. In any event, I hope this clarifies some of the mystery surrounding speed figures in general and the 2012 Kentucky Derby in particular. In the end, only time will tell which speed figures are accurate and which are not… quite literally. OK, way too complicatd for most minds. AND, the only thing that matters is the time and the win. So who cares about Beyer, or Thorograph, not me! I apologize Amy, I too felt the piece was a little convoluted. Sometimes I start one of these explanatory articles and realize — halfway through — that the subject is much more complex than I'd originally thought. 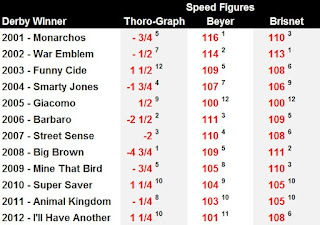 The simplest way to look at speed figures — be they from Beyer, Brisnet, Thoro-Graph, Ragozin, Trackmaster or some other service — is that they adjust the raw times so that they can be compared across various tracks, surfaces and distances. 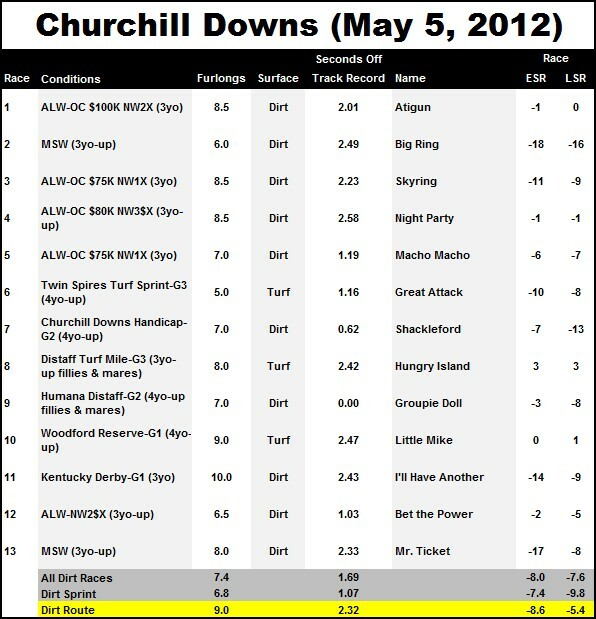 Despite the complaints, I think most of the speed rating services did a good job in the Derby. Not too complex at all. This is fabulous work Derek. Anyone who wants simple wants to lose. Great article. Truth is these numbers has contributed to the circling of this great sport. Instead of proving it on the racetrack, these numbers has done nothing but hype horses worldwide. Even the "great" Frankel has been labeled all-time great ever with his 147 Timeform rating measured at a mile. Yes, a mile and supposedly he is now better than those past great who actually got a 140+ rating at 12 furlongs.